There was an excellent turnout at the ECA(SA)’s Open Day in Mahikeng and more than 20 electrical contractors attended. Chris Koen (Regional Director, Highveld) and Frans Cronje, chairman (North West branch) said there was a good deal of interest in the possibility of a branch in Mahikeng being established and ECA courses being held in Mahikeng for North West electrical contractors. 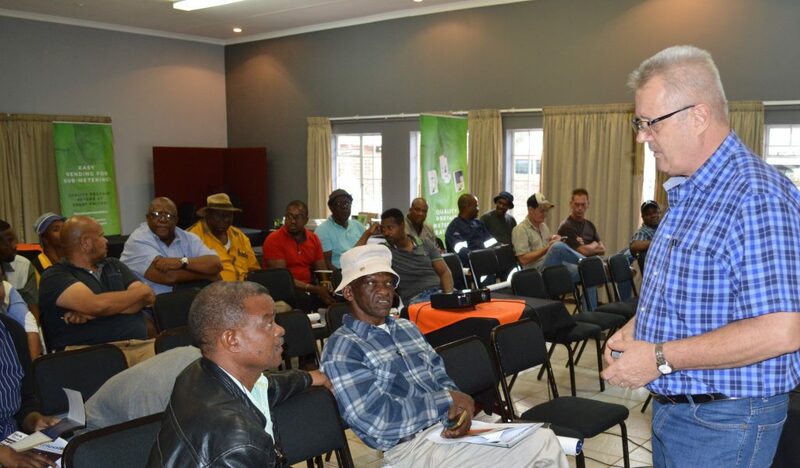 Highveld Regional Director, Chris Koen, at the ECA’s Open Day in Mahikeng. The idea behind the open day was to establish the possibility of opening a new branch of the ECA(SA )for contractors in the Mahikeng region. Chris and Frans gave presentations that outlined the history of the ECA and the ECA(SA)’s service offering for electrical contractors in the North West Province. This was well-received by the attendees, comprising four members in good standing and 18 non-members, who, says Frans, are keen to become members. “There was support for the new branch because members in the Mahikeng region have to drive more than 160 km to attend North West branch meetings and they support the idea of having their own branch,” he says. “They were also enthusiastic about the possibility of attending ECA training courses planned for the region – they want to better their businesses and themselves,” says Frans. Did you miss the Mahikeng Open Day? Any electrical contractors in the North West who missed the open day can call the Highveld office for more information.